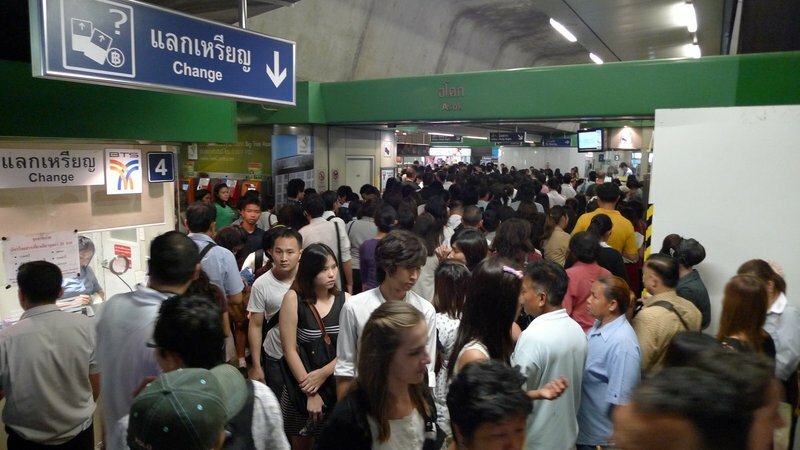 Another piece of Bangkok’s transit network puzzle fell into place on August 12, as the 5-station extension to the BTS Skytrain Sukhumvit line opened. 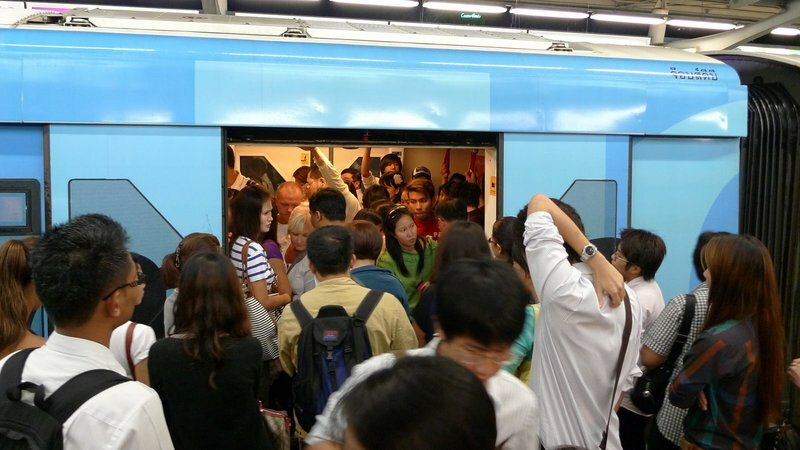 After more than a year’s delay caused by a problem ordering track switching mechanisms on time, passengers can now travel all the way to Soi Bearing (Sukhumvit 107). This extension gives access to the Bang Na district, a very congested area of the city that has long been in need of additional mass transit. Updated map on the ticketing machine obscured the day before opening. 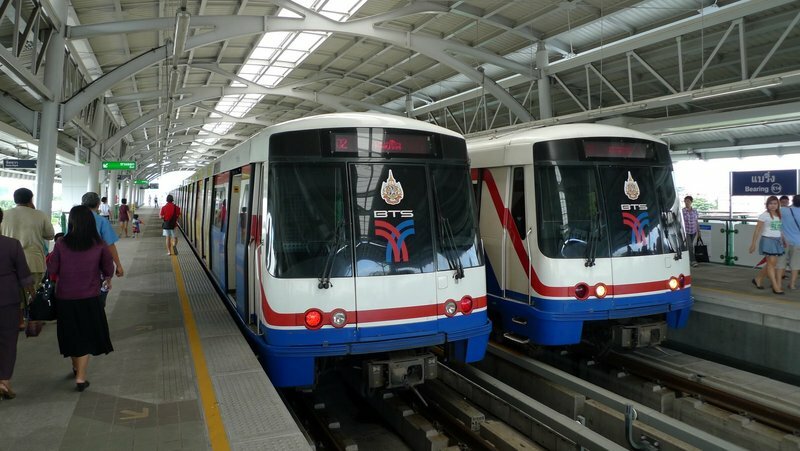 The BTS Skytrain, the first of Bangkok’s three rail transit systems, opened in December 1999 and currently operates a 55-km network composed of two lines and 32 stations. An average of about 472,000 trips are made on the system each day, with many days exceeding the half-million mark. The five new stations all have the same design with the the tracks running through the center of the station and two platforms on the outside of the tracks. An improvement in these news stations, along with two stations on the Silom line that opened last year, is that the roof covers the entire space. The original stations have an opening in the area over the tracks, resulting in passengers being partially exposed to the elements, especially the when the sun is lower in the sky. One improvement – all the new stations have elevators. 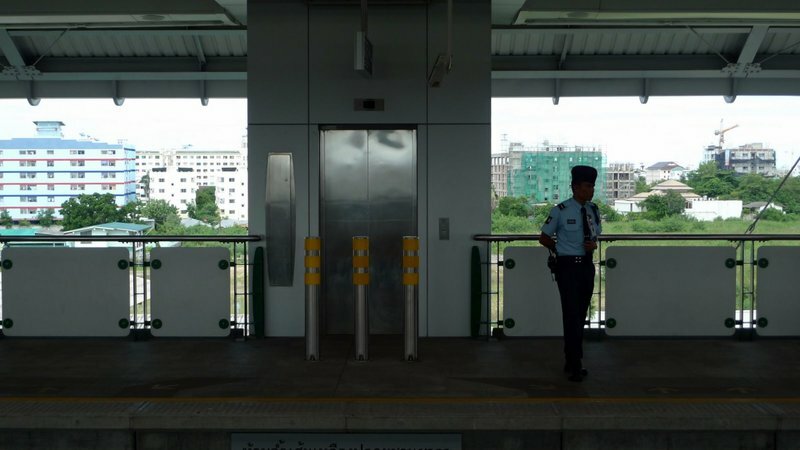 Most of the stations in the system do not have elevators, making travel by train inconvenient for people in wheelchairs (who would have a hard time with most of Bangkok’s sidewalks, too) and parents with strollers. In front of the elevator doors are three safety posts, the purpose of which is not clear. Perhaps they are meant to keep someone from rolling out of the elevator and onto the tracks. I guess if someone was backing out they may not see where the edge of the tracks is, although they would have to travel a couple of meters before reaching it. One challenge to mobility is that the stretch of Sukhumvit Road on which these new stations are built, has narrow sidewalks. The placement of station stairs and escalators essentially blacks the sidewalks, leaving no room for wheelchairs or strollers or even for two people to pass each other. This seems like a problem that could have been overcome, although I have noticed that the traffic lanes actually narrow as they pass beneath the stations, so perhaps squeezing out more space was impossible. Fortunately, there are signs of some amount of foresight in the construction of the track viaduct and support structure. At the point between Udom Suk and Bang Na stations, the track viaduct is wide enough for two pairs of tracks. In the picture above, just above the pedestrian bridge, you can see the end caps for two additional tracks. Turning 180 degrees and looking southeast along the tracks, the left side of the next support beam has a pad on which one of the track viaducts could rest. 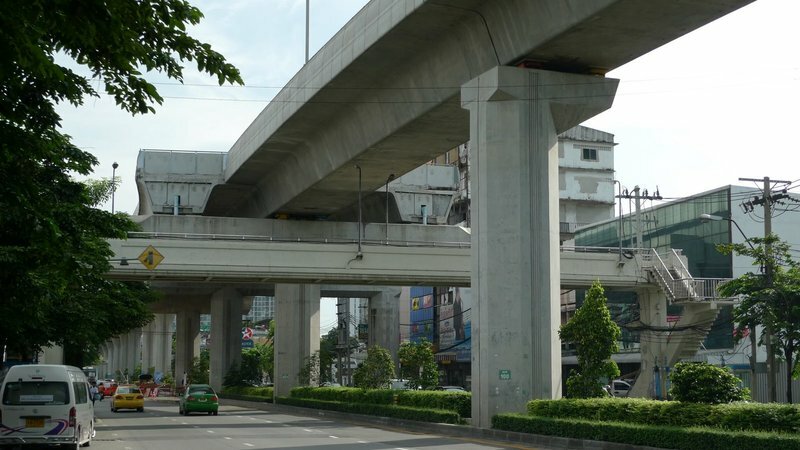 The train track passes between two levels of the expressway at Bang Na. 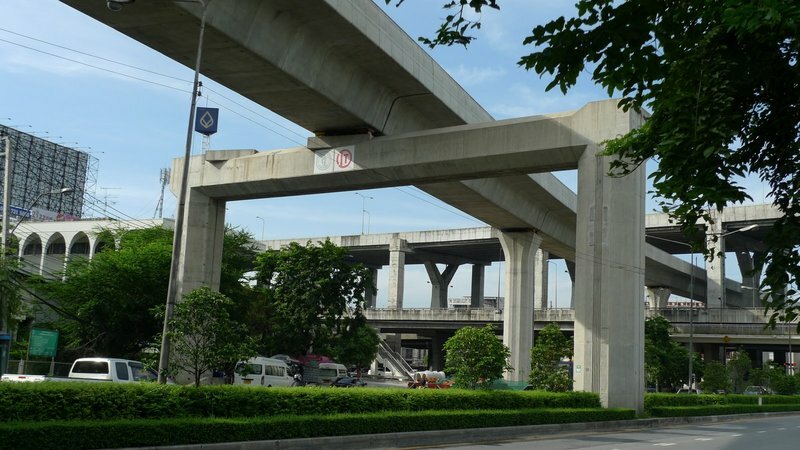 One of the planned future extensions, although there is no specific timeframe in which it will be built, is to have a spur line branch off from the main Sukhumvit line and head northeast along the expressway. This extension would include a stop at the BITEC convention center. 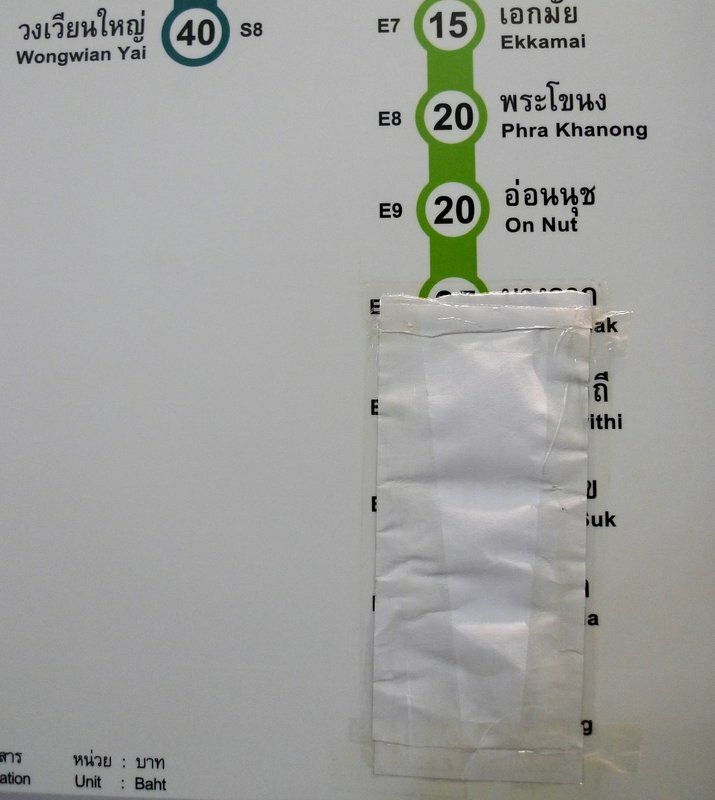 Currently, the closest station (Bang Na) is about a kilometer away, although an indoor walkway is being constructed to connect the station and the convention center and looks set to open in a few months. The problem with the new five-station extension is that it is projected to add some 100,000 additional trips to the system each day, but during rush hour the system is already at peak capacity. This view of Asoke station, taken at 6:30 pm on a weekday, is too typical. The layout of station entrances, something that would be difficult to change significantly, is narrow and results in ticket machine lines running into the fare gate lines running into still other lines. The entrance areas at the new stations seem to be wider, which will hopefully help. Another thing that would help at existing stations is to remove small retail kiosks adjacent to the fare gates. These consume real estate that could ease the congestion of foot traffic. The capacity problem is less about station entrance design, though. It is primarily an issue of not enough train cars. There are 35, three-car Siemens trains on the system. Last year, following the opening of two new stations on the Silom line, 12, four-car Bombardier trains were added, running exclusively on the Silom line. This additional capacity was immediately swallowed up. In October 2010, the operator of the Skytrain ordered an additional car for each of the three-car trains, although it seems these will not arrive until at least next year. Also next year, an additional four-station extension will open on the Silom line. Dr. Pichet Kunadhamraks of the Ministry of Transport’s Office of Transport and Traffic Policy and Planning, indicated by email that he thinks these additional train cars will satisfy demand. Earlier this year, the Transport Minister asked for residents’ patience until 2015, by which point some 60-plus kilometers of additional rail lines will have opened, adding to the approximately 103 kilometers currently operating. 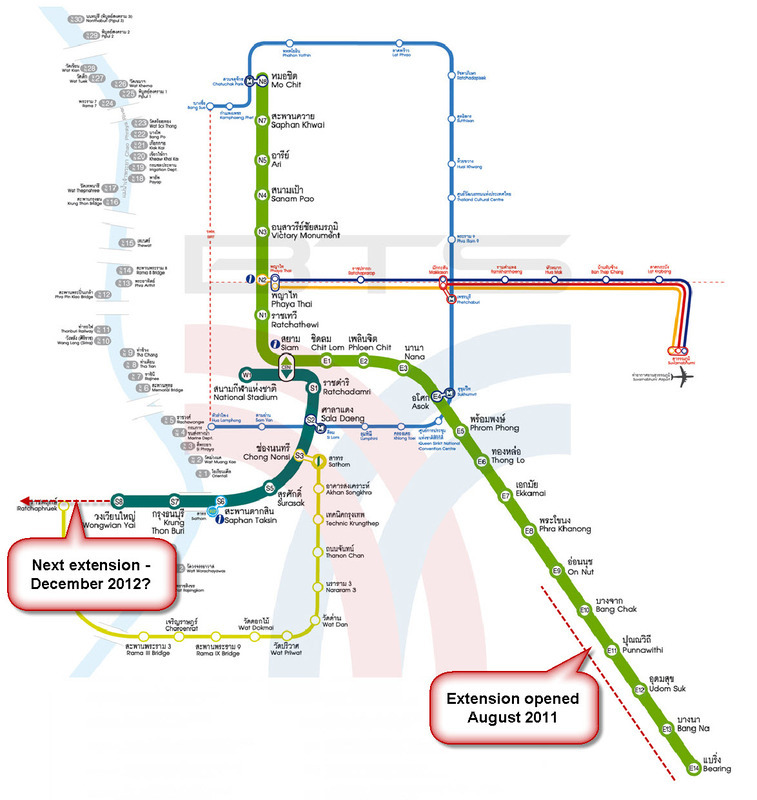 It will be interesting to see whether these new lines and extensions open on time and, if they do, what impact they have on the city’s traffic. 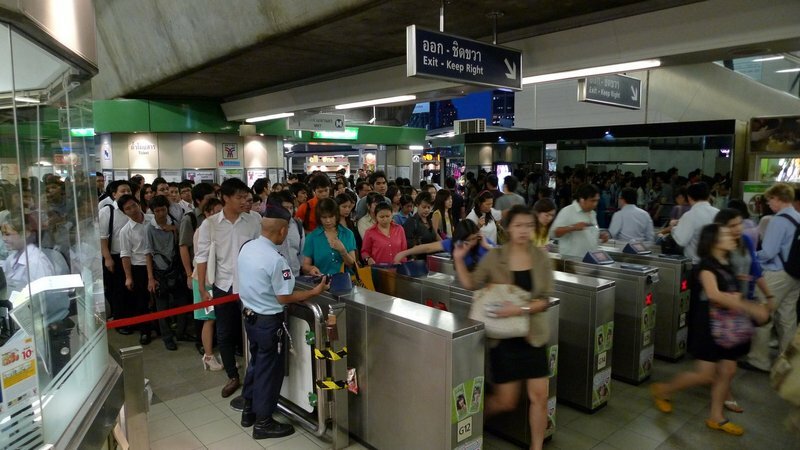 Bangkok is a city that would be well-served if it had a comprehensive network of rail transit. It would also be well-served by a bus network that feeds into that network, rather than largely duplicating it. That, however, is a topic for another day. This entry was posted in Uncategorized and tagged Bangkok, BTS, infrastructure, Krungthep, planning, rail, Skytrain, Sukhumvit, Thailand, train, transit, urban by christao408. Bookmark the permalink. Chris… thanks for noticing that thing about wheelchairs… a lot of people would never think twice about it. I appreciate that about you. I’m always excited about new rides! I hope this will somewhat ease Bangkok traffic jams. I wish SoCal area are more effiecient in light rail construction. I wish someday I can ride that to the airport. Hehe, someday, far far away, lol. @Passionflwr86 – Oh, you are quite welcome and I appreciate the kind words. The whole point of transit, it seems to me, is to help people get around. Therefore, any element of the design that presents a barrier or an obstacle to the mobility challenged is a funamental flaw. Thankfully, all new stations have elevators and there is talk of trying to retrofit more of the older stations, although in some areas that will be more of a challenge than in others. @stevew918 – Well, it looks like LA is getting more rail, slowly but surely. While in Culver City in June I noticed that the line there is making good progress and will open soon. @CurryPuffy – Yeah, I share that certain transit geekiness. I wish the Metro in DC was as concerned about those who are physically challenged! I loved using the Metro and be sure I would this one too. I felt very comfortable riding the skytrain the first visit to Bangkok. Even not understanding the Thai language, it was very easy for me to get around. I couldn’t imagine travel on Sukhumvit if there were no overhead, you can walk faster than the cars on the street. I only traveled as far as Ekkamai (bus station), what attraction would there be beyond On Nut for a tourist? The three posts in front of the elevators bothered me. If someone was using a wheelchair, how would it get around or through those posts? Or, is there enough space between the posts? I don’t remember quite so much of a crowd, but perhaps we traveled during less busy times. It’s encouraging that people are using the transit system. Here, we get continued studies and lots of excuses for not upgrading our public transit. Same catch-22 we used to have in Santa Clara Co…buses running too infrequently, inconvenient stops, time from point A to point B too time consuming in relation to car travel time. Of course, people don’t ride, then the company can’t make any money, routes are cut/buses run fewer hours, people don’t ride, etc. @ZSA_MD – There is enough space for wheelchairs and strollers to get around the three safety posts outside the elevator doors. I shot the picture from the opposite platform, so there is some foreshortening to the picture, making it look tighter than it is. @jandsschultz – The system is definitely a LOT busier than it was when you visited almost five years ago. It is tough for American communities to decide to support public transit for a whole variety of reasons, but up until the 50s, most good-sized American cities had public transit networks that were more widely used. KC, for example, used to have many streetcar lines, and LA had the largest rail network in the nation. We made some changes around then and started subsidizing private automobiles, which puts us on an endless cycle of having to build and build and build. I think we should start ending the subsidies for private automobiles, starting with gasoline taxes that reflect the actual cost to the community to build and maintain such a spread-out network of roads, car parks, etc. @Inciteful – And even when they make the stations wheelchair accessible, the surrounding sidewalks are not. There’s a long way to go here…@murisopsis – Thankfully, not so bad as Tokyo, where they have to actually push people in. Trains run pretty frequently (3 minutes or less during rush hour) so I’ll usually just wait for a train or two until it clears up. @Ricardo98 – What attractions beyond On Nut for a tourist? Well, I suppose if you were going to the Samut Prakan crocodile farm, Ancient Siam exhibit, or the Erawan Giant Elephant, you could save yourself some hassle by riding the Skytrain to the end of the line at Bearing and then taking a bus or taxi. Also, the Jim Thompson Silk Factory Outlet is one or two stops past On Nut and is easier to get to now. Before, you had to transfer to a taxi but now it is walkable. 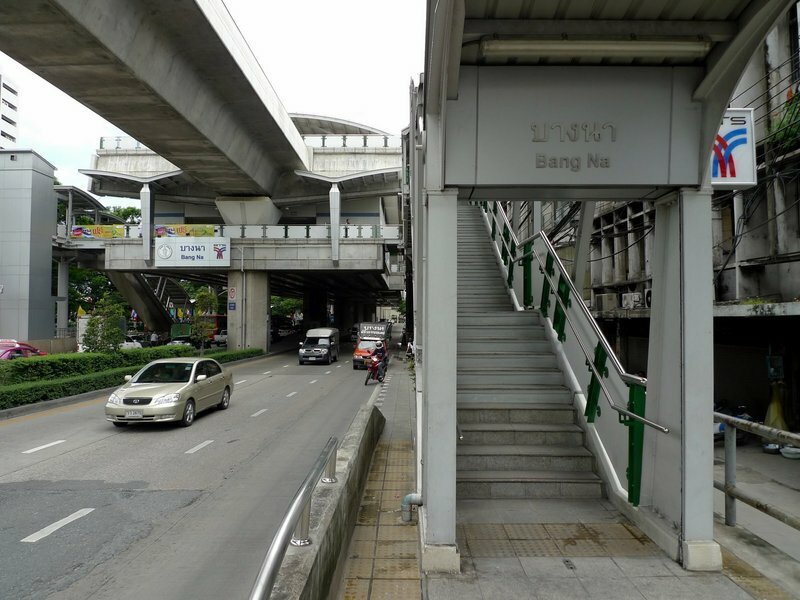 Also, if you are going to the BITEC convention center, you will soon be able to walk in an indoor connection walkway from the Bang Na station. So there are some attractions for tourists. @Fatcat723 – Isn’t the DC Metro pretty accessible? It certainly must be more so than Bangkok’s since there is strong ADA legislation. Hey, I lived in Thailand for nine months and I was in the Bangkok area. It’s so good to see all these pictures. I certainly miss Thailand a lot and all the insanity of the busy Bangkok life. Thanks for sharing. @blueberryeyes23 – You are very welcome. Thank you for your comment.